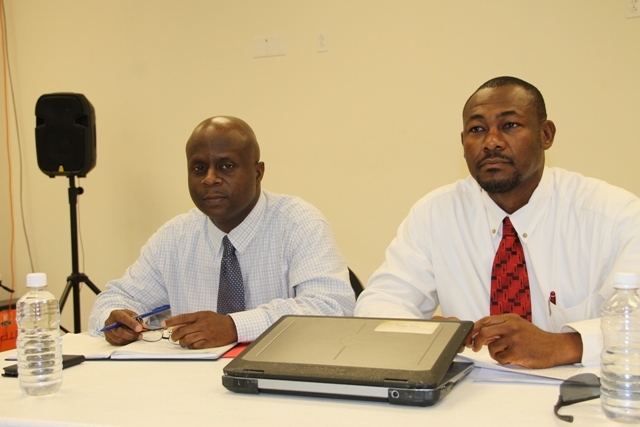 NIA CHARLESTOWN NEVIS (august 06, 2015) — Members of the Nevis Disaster Management Committee, considered to be vital in the disaster management process on Nevis, came together at the Llewellyn Newton Disaster Management Facility on July 30, 2015, to discuss the status of the planning process in the event of a disaster. Officer in Charge of the Nevis Disaster Management Office (NDMO) Brian Dyer, in brief remarks at the start of the meeting said the gathering was part of a new proactive approach to disaster management in keeping with the Caribbean Disaster Emergency Response Agency Management’s (CDERA) Comprehensive Disaster Management (CDM) strategy which has been embraced. It also serves as a management tool of all hazards through all phases of the disaster management cycle such as prevention and mitigation, preparedness, response, recovery and rehabilitation in hazard prone areas by the public and private sectors, all segments of civil society and the general population. Dyer pointed to the significance of the strategy, noting the increase in frequency and intensity in disasters over the last 30 years globally. He said as a result, St. Kitts and Nevis has realised the need for the proactive approach to disaster management. 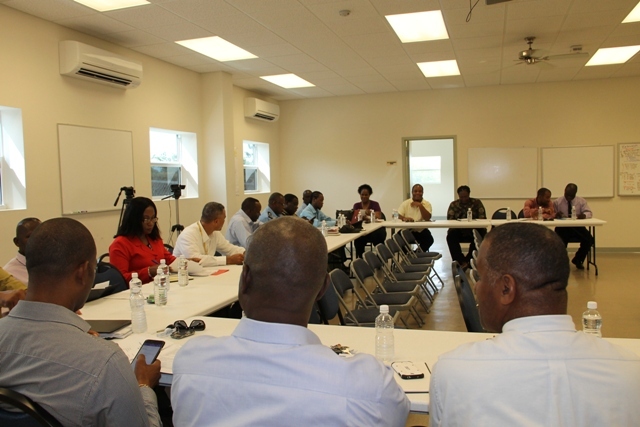 According to Head of the NDMO, the Management Committee which is responsible for activating communities throughout the island to deal with any type of disaster, its roll in disaster management is critical. “This Committee plays a pivotal role in the overall supervision of Risk Reductions on the island. Its functions of emergency planning and response are divided into five categories: informing, warning, coordinating, providing and evaluating,” he said. Dyer referred to the recent increase in seismic activity around Kick em Jenny in Grenada, the unrelated seismic activity in the Leeward and off the coast of Barbados, the Sargassun sea weed, the drought affecting the North Eastern Caribbean and the current Hurricane season, which he said served as a reminder for St. Kitts and Nevis to be more vigilant and to shoulder roles and responsibilities in an effort to enhance operational readiness. He reminded that disaster preparedness and planning are continuous exercises and a year-round preoccupation, not only for the Department or members of the Committee and the emergency sub-committees but also for every citizen. However, government agencies, CERTs and community volunteers, Faith Based Groups and private organisations are required to prepare their own internal disaster plans that must be reviewed and tested every year. “It is therefore the responsibility of every citizen to become familiar with the Nevis Disaster Management Plan and the roles which he or she is expected to play in the event of a disaster that, should action be necessary, the response would be instinctively orderly rather than merely a panic-stricken reduction and management process. “Everyone must be involved in increasing the degree of preparedness and resilience of the island of Nevis,” he said. Also present was Permanent Secretary in the Premier’s Ministry Wakely Daniel, who stood in for Premier of Nevis and Minister responsible for Disaster Management Hon. Vance Amory.